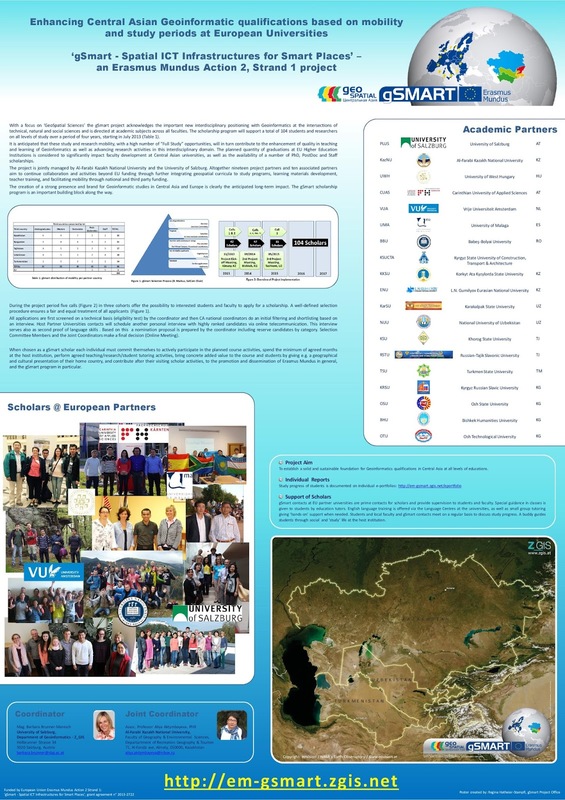 The gSmart Erasmus Mundus scholarships initiative is based on a network of European and Central Asian Universities with a focus on interdisciplinary ‘Spatial Sciences’, aiming at improving the management of societies, economies and environments through modern geospatial methods and techniques. Aiming at students or staff who are working (or planning to work) with spatial methods like GIS or Remote Sensing or GNSS on explicitly “spatial” problems in any relevant discipline! During their studies at a European partner university, applicants will receive a sound education in the field of Geoinformatics. Bachelor level students will take part in regular exams, typically in English language. Master students for example will have the chance to finish their studies with a Master in Applied Geoinformatics, Master in Spatial Information Management or Master in Water and Environment. PhD and Postdoc scholars will be involved in co-teaching and team teaching. Staff mobility will be dedicated to short term teaching visits. gSmart only targets disciplines sharing a spatial dimension: Geography, Geodesy, Geology, Architecture and Planning, Regional Social Sciences, Resource Management, Water and Environmental Studies, Agriculture, Regional Economics, Transportation, Civil Engineering etc. Applicants from these disciplines use common digital models, technologies and methods as a core qualification in high demand in academia, industry and administration; they enhance their competences in Geographic Information Systems, Remote Sensing, GNSS, decision support and impact assessment, geovisualisation, geostatistics and spatial data infrastructures. The gSmart network will be sharing and building knowledge, competences and skills across disciplines, via mobility of students and faculty between institutions, joint short intensive courses and a virtual campus with online lectures, converging in a highly qualified community of practice.